By Ashutosh KS in Internet. Updated on April 9, 2018 . Bitcoin has seen tremendous growth in 2017, however, it’s price almost topped to 4.5k USD, thus limiting further investments due to high price. And that’s why, altcoins like Ethereum and Dash are gaining limelight these days. If you ask me, investing in altcoins is a good strategy as these are new and low-valued in comparison to Bitcoin, and thus, have more chance to grow over the period of time. And let me remind you that a bitcoin’s value has grown to this price in almost 8+ years. Alright, let’s discuss about the best altcoins you can invest your time, efforts and money in. Do note that I chose these altcoins based on their business idea and people’s interest as well as their market cap at the time of writing this post. Also, don’t forget to study and understand the nature of crypto market before investing in it. In short, you can understand it as the world’s first blockchain supercomputer which can run apps and services built on blockchain. Due to the Ethereum features and its potential to change the world forever, it has caught everyone’s attention including corporations like Microsoft and individuals like you and me. It also attracts developers to use its features to create decentralized apps using smart contracts that run on the Ethereum network, thus increasing its popularity and value. And seeing the growth in usage of this platform, an ether’s price crossed 400 USD in June 2017, although it didn’t stick there for long. 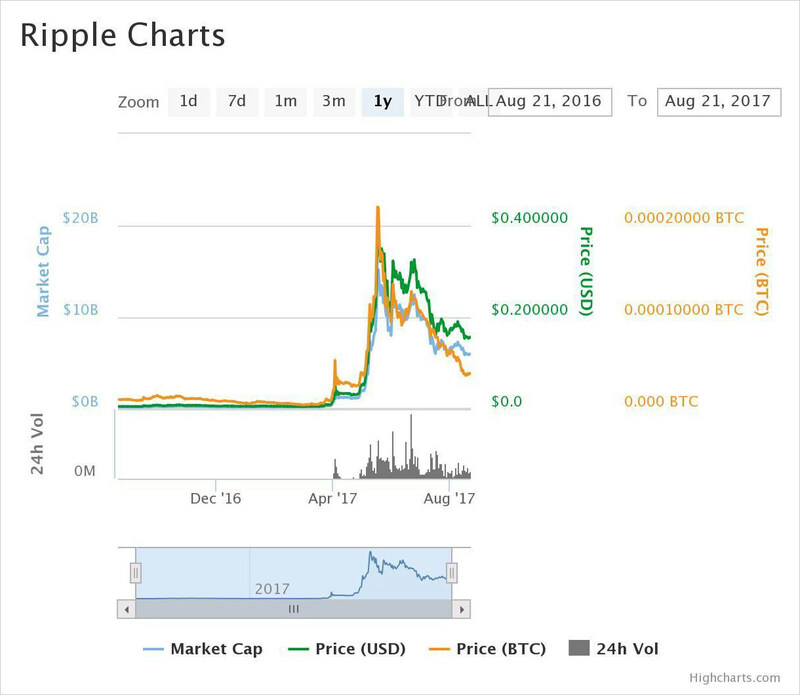 After dropping to half the maximum price in a month, it gradually rose and was traded between 300 – 350 USD during August 2017. Bitcoin Cash [BCH] is the first hard-forked cryptocurrency of Bitcoin, and you can also say it’s the brother coin of Bitcoin. Launched on 1st August 2017, this currency was born as a result of a civil war among the Bitcoin community. The reason of the conflict was the proposition of two solutions for the common problem of improving the efficiency of Bitcoin network. As it’s a hard-fork of Bitcoin, every person who had bitcoins on 1st August, now also has the same amount of bitcoin cash. Well, that’s a pretty handsome treasure seeing the current price and expecting its growth in near future. 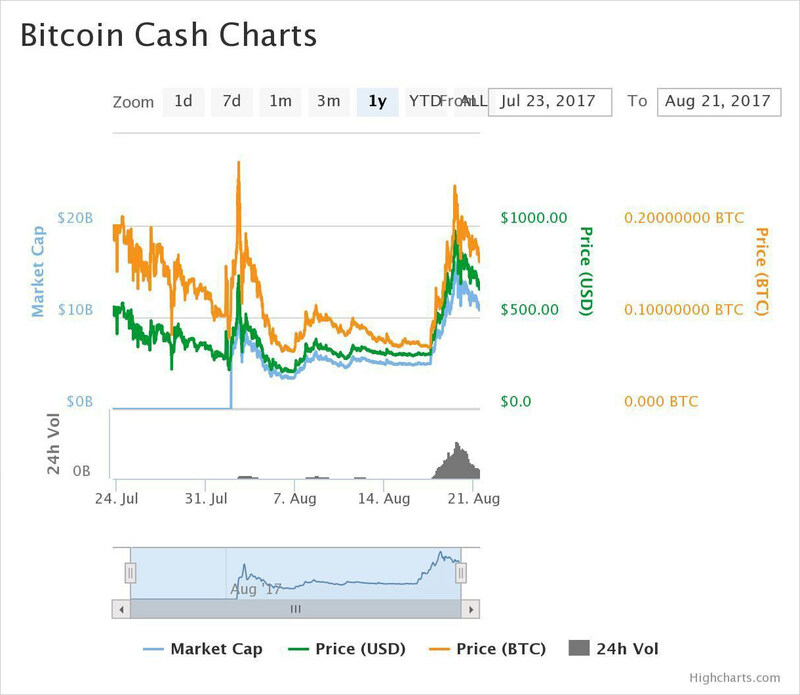 In a month of its birth, the value of 1 BCH rose near to 1k USD but due to high volatility, it’s high price didn’t took time to fall down. Ripple [XRP] is a cross-border payment platform for financial institutions including banks, payment providers and digital asset exchanges. Unlike most of the other cryptocurrencies who run away from centralized institutions like banks, Ripple has a different motive to help banks and similar organizations to send money quickly, cheaply, and certainly. Though its price doesn’t fall anywhere near Bitcoin and other high-priced digital assets yet it has seen handsome growth in 2017. Its price rose near to 0.4 USD (I know it’s very less if compared to BTC’s price of 4.5k USD) seeing its rising demand and potential use in lowering international money transfer charges as traditional money transfers cost much. Litecoin [LTC] is a digital currency that was born out of Bitcoin’s own shortcomings. Its network generates 4x more coins than the Bitcoin network, claims to confirm transactions faster, and utilizes scrypt as proof-of-work algorithm. Using the scrypt, Litecoin tries to discourage mining using GPUs, FPGAs, and ASICs. 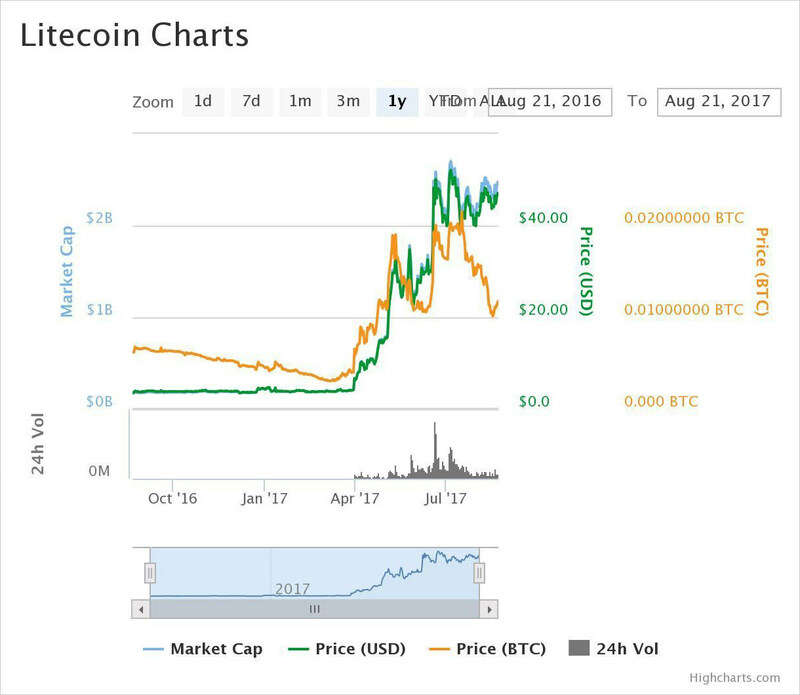 If I talk about its place in cryptocurrencies, Litecoin ranks under ten in terms of market capitalization, and its price rose as much as to almost 55 USD in July 2017. Though LTC’s price doesn’t stand anywhere near BTC’s yet it’s a good investment seeing its larger supply of coins and growing adoption by individual investors, exchanges and merchants. Dash [DASH], an open-source p2p cryptocurrency, brands itself as the “Digital Cash”. It’s maintained by a self-funded, autonomous organization. It’s built with various additional features to that of Bitcoin, Litecoin and alikes including InstantSend (instant transactions), PrivateSend (private transactions), and DGBB (decentralized governance). 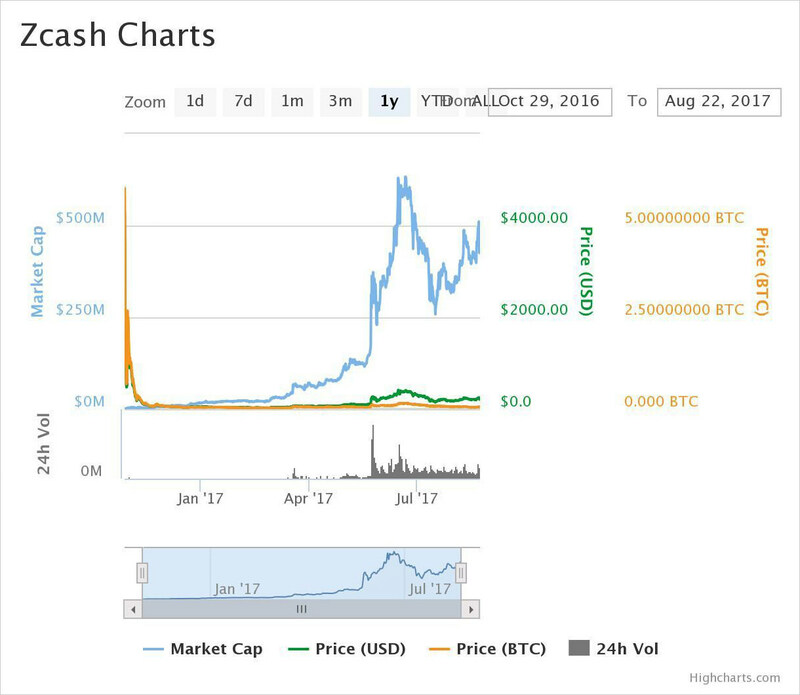 If you check its price, you’ll see a high rise during 2017 similar to that of various others, and that being said, its price rose to 320+ USD in July. And seeing the rank list, it’s under ten if I consider market capitalization. Considering its unique features that fill in the holes in Bitcoin and other similar networks, Dash has the potential to rise and shine in future. 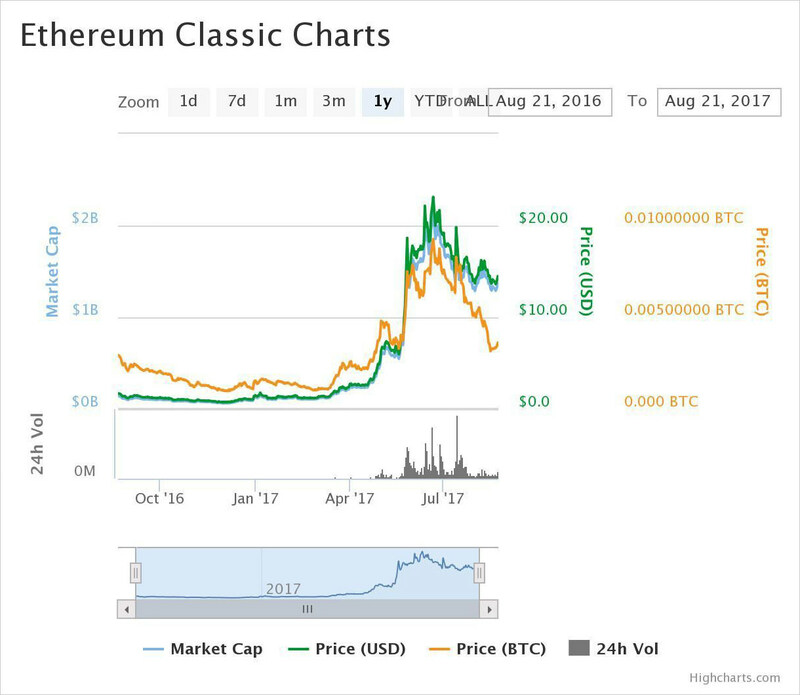 Ethereum Classic [ETC] was born out of Ethereum as Bitcoin Cash was born out of Bitcoin — due to a civil war among its initial community. Being a hard fork of Ethereum, it’s also a decentralized software platform featuring Smart Contracts, DApps, DAOs, etc. And similarly, a crypto-fuel, i.e., token named ‘Classic Ether‘ is required to use the platform. Though it has been 2+ years since this platform got created, yet its price has not seen as growth as its older brother Ethereum — probably because it’s not as popular as the other. 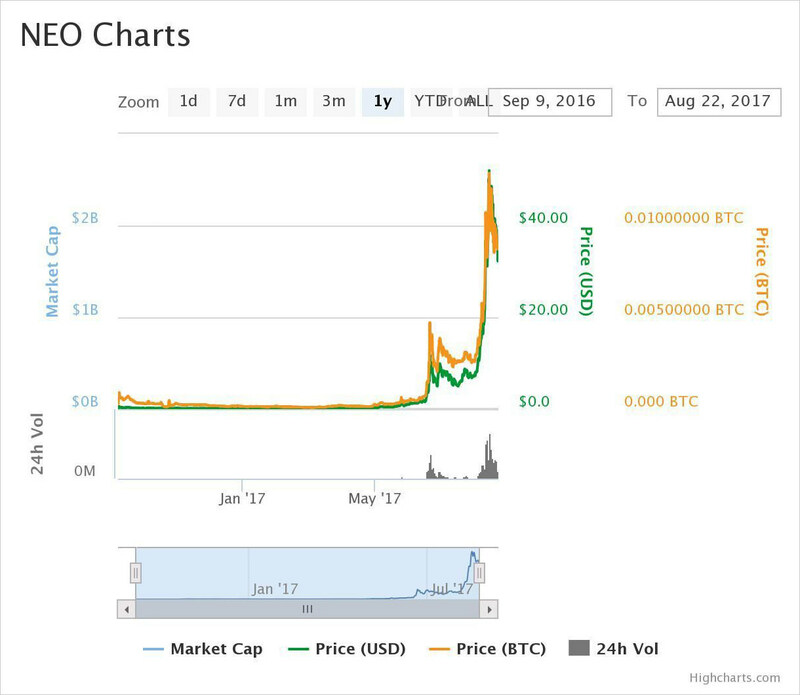 In 2017, it too experienced growth and its price reached 24 USD in July. As it still has lot to grow and it’s slowly working to gain its own identity in the crypto world, it’s worth a try. BitConnect [BCC] is just a currency like Bitcoin and Litecoin with some differences than Bitcoin including scrypt proof-of-work algorithm and support for proof-of-stake that gives incentive to stakeholders. Additionally, I’m quite amazed that BCC can be exchanged directly between its community members without a central crypto asset exchange. 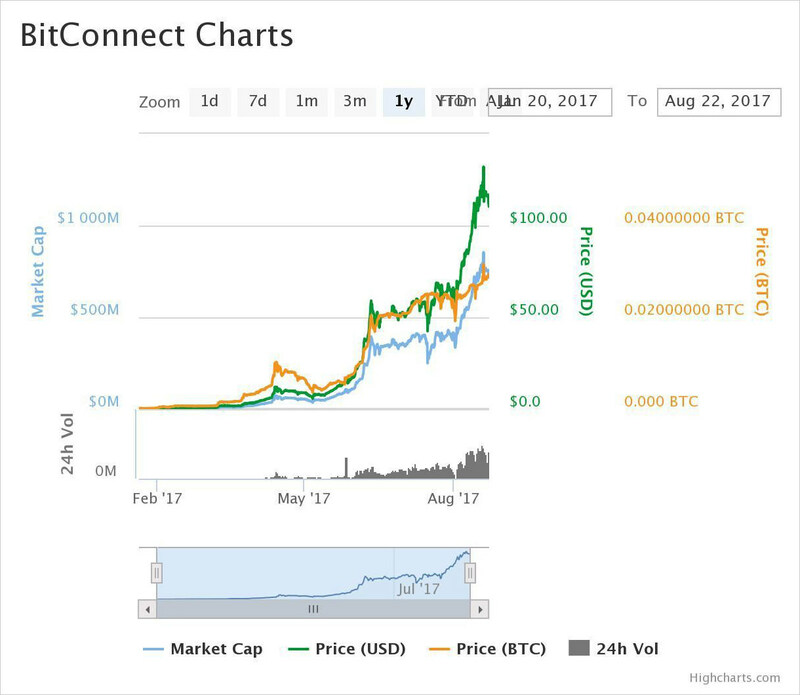 BitConnect Coin has seen major rise during mid 2017 though it’s not yet a year old, and surprisingly it rose to 130+ USD per coin in July. The rise is a result of growing demand, which itself is due to advancements like faster transactions. I also liked its interest-bearing feature that lets you earn interest by lending your coins to its community. Zcash [ZEC] is built to secure your payment history which is exposed by other cryptocurrencies — even the first known. Zcash somewhat extends Bitcoin and that being said, it has two types of addresses — transparent (work just like Bitcoin’s) and private (the new addition). It also features shielded transaction which hides sender, receiver and amount. Its popularity and growing demand is result of its superb privacy enhancement over other privacy-focused currencies like Monero. 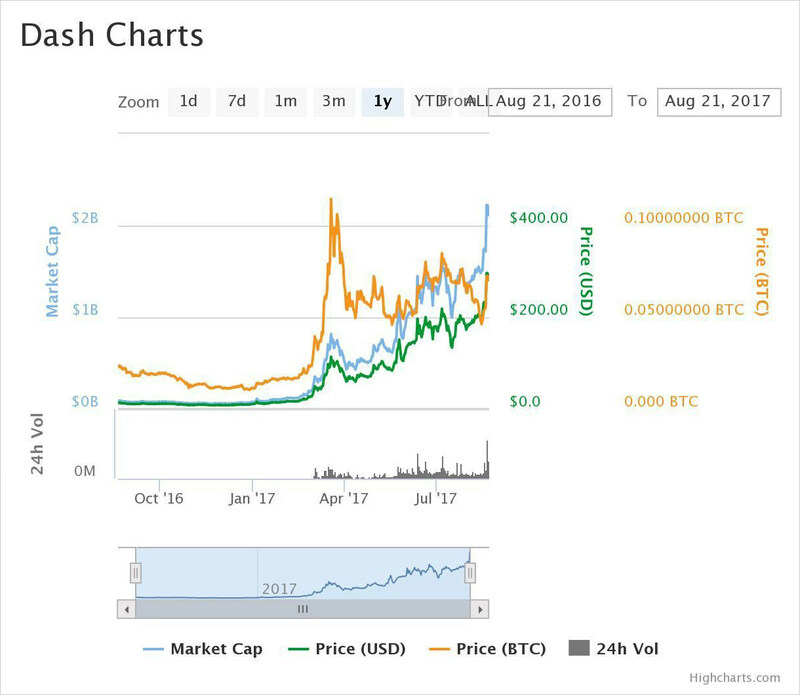 It has not been a year since it was launched and Zcash had already crossed the 420 USD price mark during June 2017. Though it didn’t stick to that price and had fallen down to almost its half in just a month, sadly. 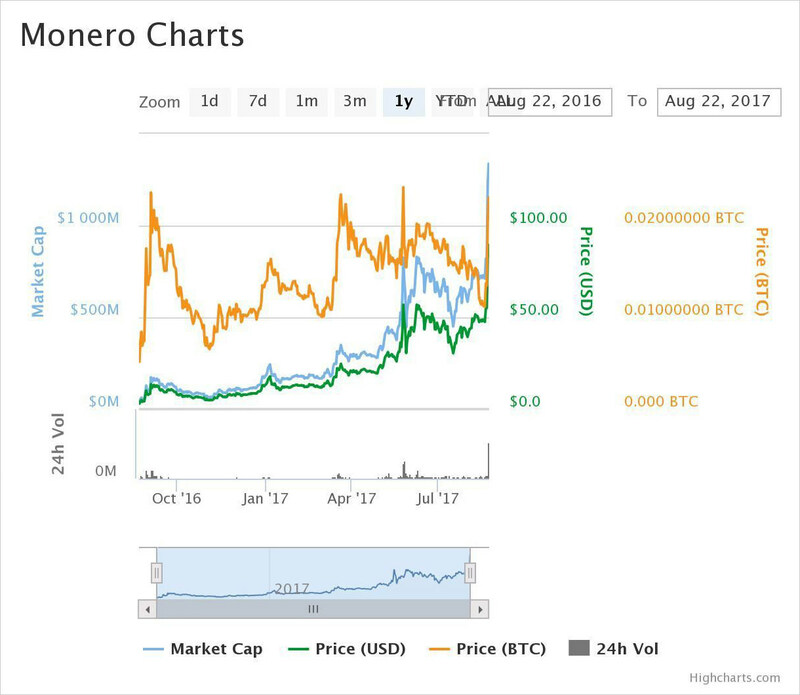 Monero [XMR] advertises itself as the ‘Private Digital Currency’ that doesn’t trade off privacy for the sake of security. It’s just a blockchain-based currency like Bitcoin but packs in extra privacy features as offered by secure currencies like Dash and Zcash. Being a privacy-centric technology, Monero transactions aren’t traceable via the blockchain unlike Bitcoin. Unlike Zcash, Monero transactions are private by mandate, i.e., sender, receiver and amount are all hidden although transactions are not as private as advertised. Though it’s three years old, it didn’t see high demand and growth until October 2016, after which it’s been growing continuously and its price rose to 90+ USD in August 2017. NEO [NEO], formerly Antshares, is a smart-economy software platform like Ethereum which even supports Smart Contracts. Unlike Ethereum which only supports Solidity for writing programs on its platform, NEO, also known as ‘Chinese Ethereum’, supports popular languages. Also, NEO supports an identity protocol unlike other smart contract based coins. NEO has lot more differences or unique features, e.g., it uses dBFT (delegated Byzantine Fault Tolerance) and not proof-of-work or proof-of-stake to secure its network. 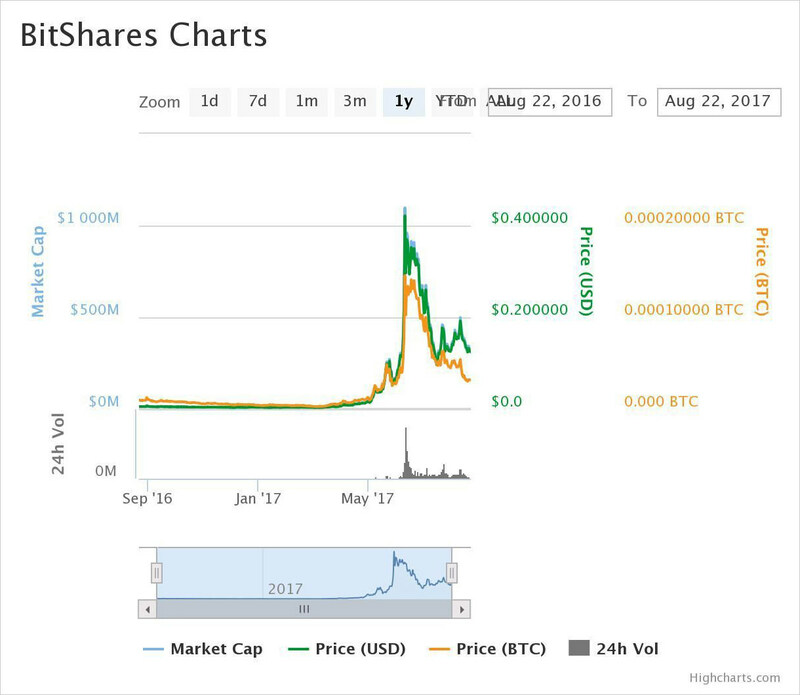 Though NEO is rebranded out of Antshares which is three years old, it didn’t reach high price until August 2017 — its price rose to 50+ USD in this month mostly due to high demand. BitShares [BTS] is an Ethereum-like cryptocurrency that features Smart Contracts unlike Bitcoin. However, it offers much more features than just smart contracts, e.g., BitAssets, DEX (Decentralized Exchange) like BitConnect, etc. BitAssets are smart currencies, e.g., BitUSD is backed by value of 1 USD, i.e., it’s digital coin for the value of a real commodity. In spite of it being available from three years, it hasn’t seen much growth in its price until 2017 when its price rose to 0.42+ USD in July. I know that’s incomparable to the price of Ethereum, Zcash or others. But its high supply is the reason behind its low value, else it ranks under 25 if I talk about its place in the market capitalization list. Namecoin [NMC] is a decentralized, blockchain-based domain registrar (like GoDaddy) that assigns you names under the uncensored ‘.bit’ top-level domain. For example, if you register a domain name ‘aksinghnet’ with Namecoin, then you’ll receive a domain ‘aksinghnet.bit’, which can be looked up and browsed using its own wallet software only. The purpose of Namecoin is to provide human-readable yet anonymous domain names unlike Tor and I2P whose domain names are set of some random digits. 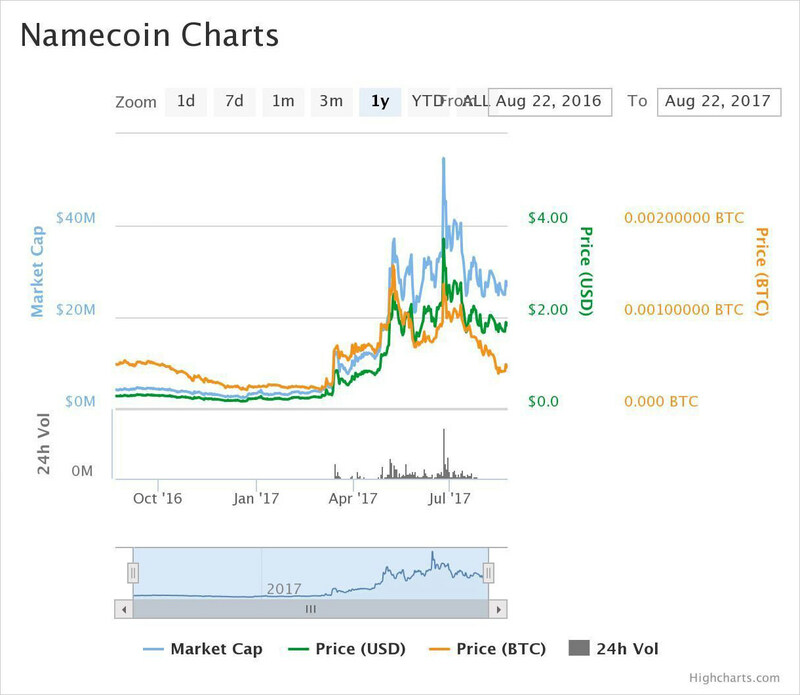 Though Namecoin is the first Bitcoin fork and exists for three years now yet its price is not as high as Bitcoin’s and Ethereum’s. Its highest price was 2.70+ USD till August 2017. Sia [SC] is a decentralized cloud storage platform unlike centralized cloud storage platforms such as Google Drive and Dropbox. It’s built upon the blockchain technology and is not just a currency unlike Bitcoin and Litecoin. Yes, you do need a token or coin named Siacoin to use its cloud storage in the same way as you need Ether to use Ethereum platform. Siacoin, like other blockchain-based solutions, depends on its features and popularity to rise and shine. And Siacoin is amazing — just think about paying for storing individual files on a blockchain from where it can never be lost realistically. 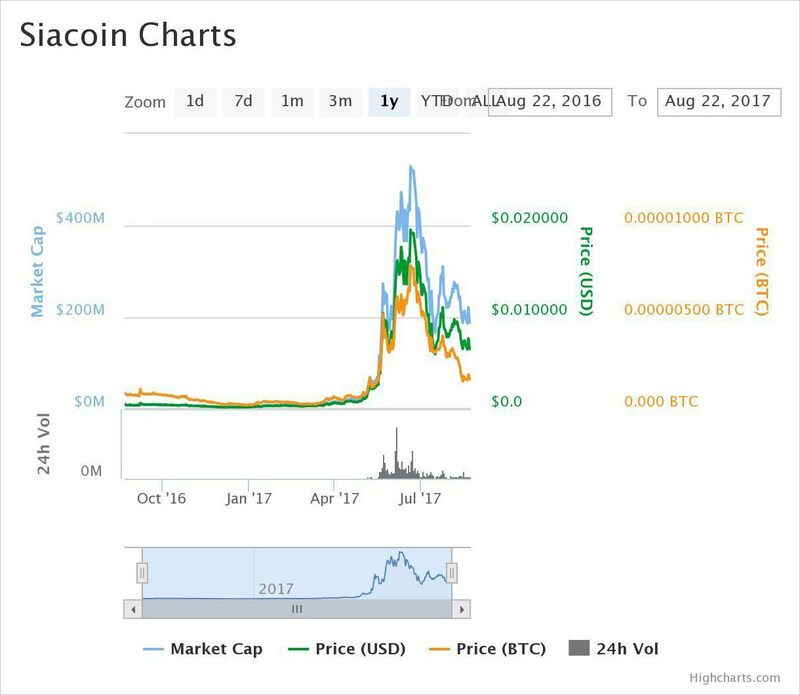 Siacoin is 1.5+ years old but it only saw a sharp rise in its price recently. In June 2017, its price rose to 0.022 USD. Komodo [KMD] is a brand-new cryptocurrency packed with best features of other coins. It offers smart contracts, decentralized exchange, etc. It’s built with Zcash’s features, thus Komodo supports transparent as well as private addresses and anonymous transactions. Also, it uses delayed proof-of-work (dPoW) and not PoW or PoS to secure the network. Komodo is trying to solve bottlenecks of cryptocurrency adoption and what really amazed me is its plan to launch 32 independent, fiat-pegged cryptocurrencies. That means, you’ll be able to convert between fiat and digital currencies more easily than ever. Though Komodo is a young platform (not a year old) that’s still in development and will be ready for general use in near future, yet it’s growing in popularity as people are understanding its potential use. In June 2017, it traded at maximum price of 2.40 USD. Steem [STEEM], unlike others in this list, is a social media platform that encourages people to share interesting content and get rewarded. That means, you earn this cryptocurrency by just posting or curating content and commenting on others’ posts. As you must have guessed by now, Steem is a totally different cryptocurrency than Bitcoin, Ethereum and alikes. 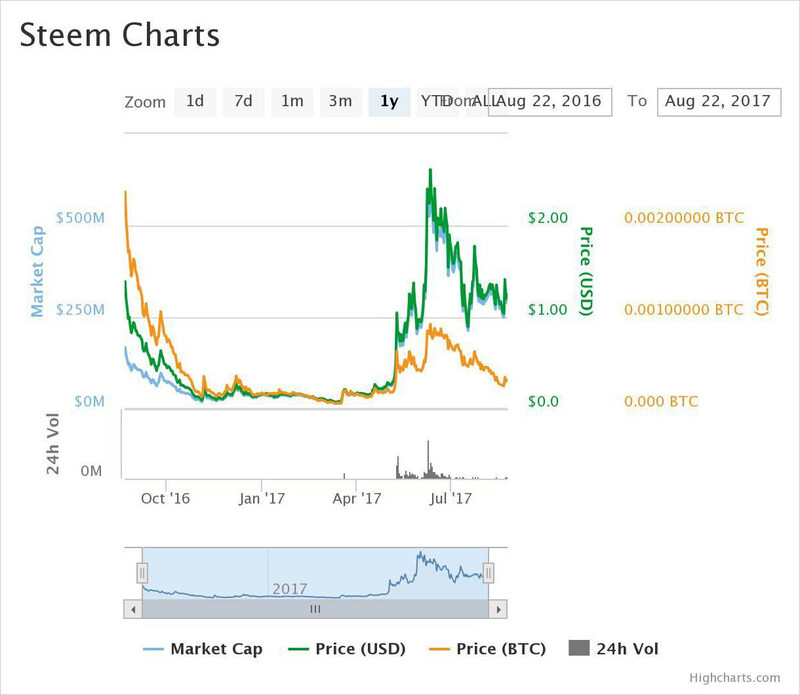 Though Steem was better priced at 4.30+ USD in August 2016 than it’s in August 2017 — it rose max. to 2.50+ USD by August 2017. Steem’s supply is unlimited unlike Bitcoin and Zcash, hence its price may drop with increasing supply but an increasing demand may balance it. That means Steem will only grow with increasing popularity and user base. This year has seen sharp rise in popularity of digital assets as the prices of cryptocurrencies jumped high to surprise everyone. It was no wonder that we saw Bitcoin crossing 4.5k USD and the crypto market capitalization crossing 100 billion USD. That being said, it’s hard to predict the market in the future. But as it’s mostly driven by supply and demand, and some of the currencies are backed by good, useful technologies, we may see the market growing with time. However, that’s not certain, obviously. That’s why, I’ll advice you to study the crypto market before investing in it. Have you invested in cryptocurrencies? Which is your favorite altcoin? Please do tell me your answers by writing a comment below or writing to me at @aksinghnet.